Posted by Sasja Mazurkiewicz on 8 April. Freelancing, contracting and working from home (or wherever) is a different world, it is often portrayed as ‘The dream’, the digital nomad sitting from a bamboo hut on the beach, cocktail in hand, sending their latest invoice to their employer on the other side of the world. That’s what I was expecting, and days have been similar, but there’s also a dark side… not like a horror movie dark, just sitting alone in a room forgetting to turn the lights on, no one around you type of dark. That’s the place I found myself in during my first month of freelancing. To update you all, I moved 20 minutes north out of Kerikeri, with my cat, birds, partner and soon to have 2 chickens. Rent here is cheap, my daily commute is from my kitchen to the lounge, and casual Friday’s are every day. I work between 20–30 hours a week for two companies (one in the states and another in Auckland), mostly doing visual design and research related work. It’s now my third month here, and third time lucky really applies to me, I’ve made some changes based on my challenges. As I reflect back, these are the three key things I learned, and wished I did in my first month working (super) remotely. There is some beauty to working in an office, the ‘Hey, how was your weekend?’, ‘We’re going for after work drinks, want to come?’, the casual banter with the person working next to you, and that familiar face you see on the elevator every day — is no longer. What was driving me mad that first month was not having someone to bounce ideas off with, I needed someone to guide me along, ask me questions I don’t ask myself and surprisingly — ask me how my weekend was. 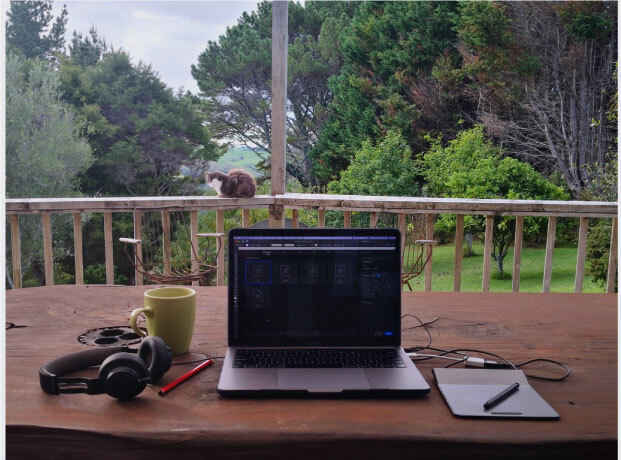 So I reached out to my contacts and started Skyping with people that have inspired and continue to inspire me, what would usually be a coffee catch up in Wellington, is now a quick 30-minute remote call now and then. A special shout out to Chris Jackson from wecreatefutures, who has worked wonders in sparking my creativity, shifting my perspective and ensuring I keep up with the industry. I followed people’s advice and tried working from cafes and co-working spaces (yes the far north has a co-working space believe it or not), but the work still wasn’t flowing. Also, we live 20 minutes from town, it’s a waste of petrol and I really like my space, it’s homely, I can play my music as loud as I want and I can work in my pyjamas, why would I give that up? I needed a way to detach from my home and into work, I’ve started getting up at the same time every day and making a plan to start work at the same time. My official work day starts after I’ve watered the plants, when I’m at my desk, with my email and Slack open, coffee in hand and the music flowing. My morning ritual helps me zone in and focus on the day to come. No this is not a paid advertisement. Hnry is an online account software, they manage my invoices, pay my taxes and keep a record of my expenses. This software has changed my life, the stress and worries of ‘Am I doing it right?’ are gone and I can focus on simply doing my work. If you’re working as a freelancer or contractor, check Hnry out (use the code: SASJA1374 to get $25 credit, whoop!). As I reflect back on that first month, all it took was time, time to figure out my flow, time for trial and error, time to make it my own. I’ve realised that the work hasn’t changed, but how I work is different in many ways. It has shown me that I don’t have to choose, I can choose to create my own path, whatever that looks like, it’s scary, because there’s no manual for this, but I love it. Now that I head into my fourth month, my chillies are thriving, the chicken coup is ready to go and my contracting work is as busy as ever. Let’s see what this next month will bring me. This article was originally published on Medium by Hnry customer Sasja Mazurkiewicz. The article was republished with the author’s permission.